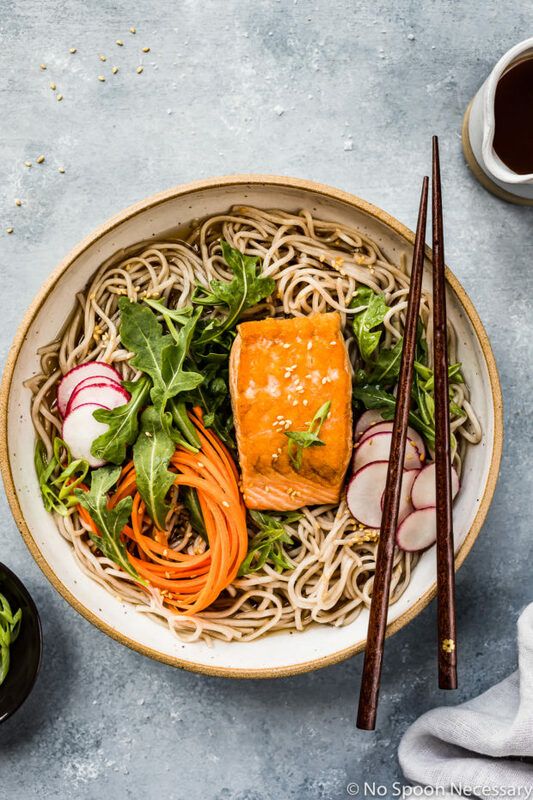 This Green Tea Poached Salmon Soba Noodles bowl is healthy, nutritious and seriously satisfying! 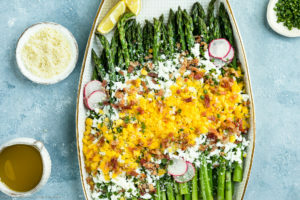 Easy to make and even easier to devour, this warming dish is guaranteed to soothe your soul! So, is it finally feeling like the fall season where you are?! I know that some people have already experienced their first snow storm of the year, while others are still enduring temperatures in the 90’s (hello, Mom!). It finally feels like autumn here and I couldn’t be more excited since this means fuzzy sweaters, buttery soft blankets and suede booties galore! Cooler weather also means all the cozy, warming dishes to soothe the soul! And guess what? That is exactly what I’m sharing with you today. 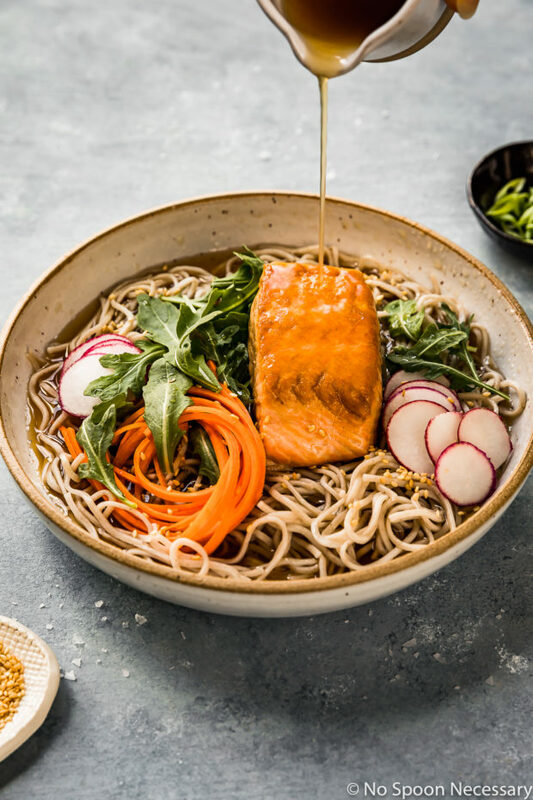 Silky soba noodles and tender, protein packed salmon soaked in a delicate green tea broth infused with fragrant ginger, pungent garlic sweet mirin and rich soy sauce. 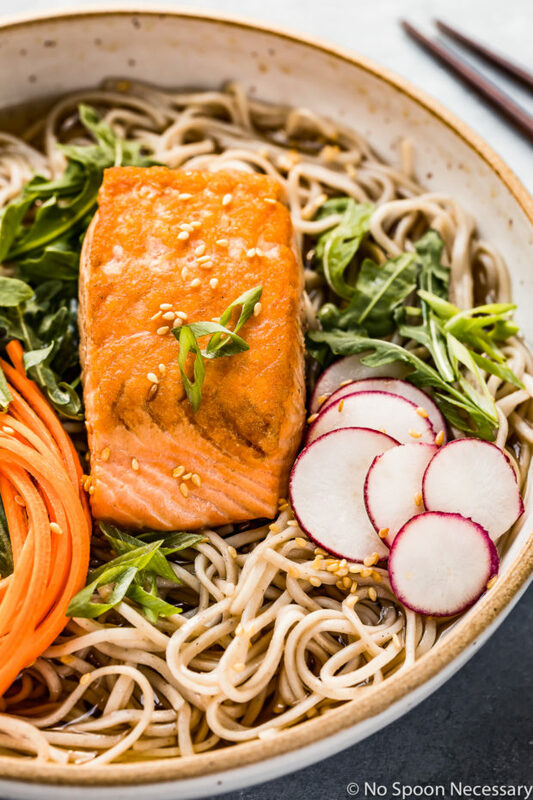 Topped with peppery arugula, crisp radishes and crunchy julienned carrots, this soba noodle bowl packed with both refreshing and cozy vibes. 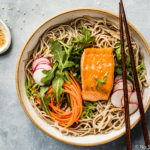 Nutrient dense, this poached salmon soba noodle bowl is healthy and light, yet seriously satisfying and 100% slurp-tastic! Green tea is incredibly healthy and great for you! Green tea is loaded with antioxidants, nutrients and it has impressive health benefits. The caffeine in green tea is proven to have a stimulating effect and improve brain function. The compounds and nutrients in green tea have been shown to reduce inflammation. Green tea is found in many fat burning supplements as green tea has been proven to boost the metabolic rate and increase fat burning. Green tea has been shown to cause mild reductions in blood sugar levels. 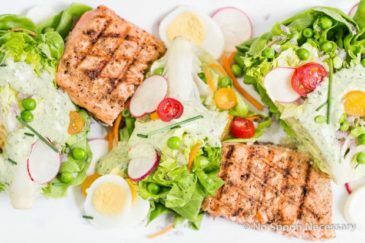 So, what happens when you combine the power of green tea with heart healthy salmon? Health benefits by the dozen!! What temperature for poached salmon? The perfect liquid temperature for poaching salmon, or any fish, is 140 degrees F.
The most accurate way to tell if the poaching liquid is at the correct temperature is by using an instant read thermometer. To test the liquid, simply hold the tip of the thermometer in the liquid until you get a temperature reading, and then adjust the stovetop’s heat element up or down accordingly until you get a temperature of 140 degrees. Don’t have a thermometer? No worries! To tell by sight alone if the poaching liquid is at the proper temperature, look for the water to have slight movement. You should see some steam rising from the pot with barely a couple little bubbles. Remember that the liquid should not be simmering. 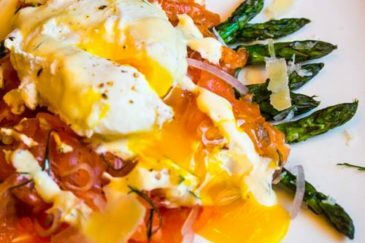 How long do you poach salmon? The length of time salmon takes to poach depends on the size and thickness of the fish. Salmon the same size and thickness as shown in these photos generally takes me minutes 9 minutes cook. If you are using an instant read thermometer and cooking the salmon at a constant 140 degrees F, the salmon will not overcook. 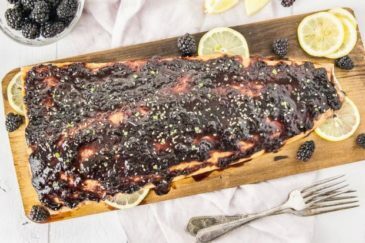 However if you are going on sight alone for the poaching liquid temperature, I would err on the side of caution and cook the fish according to the tea poached salmon recipe below. How to tell when poached salmon is done? Use an instant read thermometer. The USDA recommends a minimum temperature of 145 degrees F for fish. Always test the temperature of fish by inserting the thermometer into the thickest part of the filet. Use a fork. When salmon flakes easily with a fork, it is done. Use your sight. When salmon is opaque on the outside with a slightly translucent, pink center, the salmon is cooked. Salmon is overcooked when the center is opaque, and it is undercooked if the center is completely translucent. Poaching is one of the healthiest ways to prepare salmon. Salmon is a great source of protein, rich in omega 3’s, high in B vitamins, and provides heart and skin healthy antioxidants. 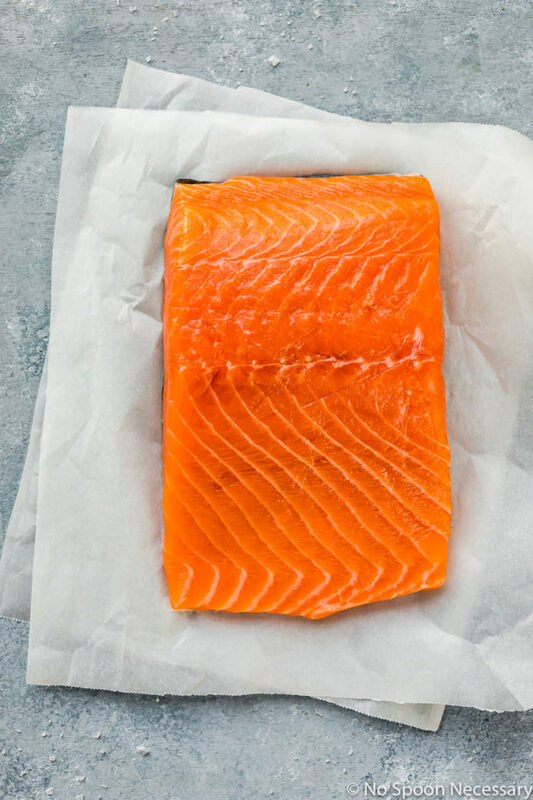 Poaching salmon not only ensures a moist, tender fish, but also preserves the nutrients and beneficial omega 3’s much better than any other method of preparation. 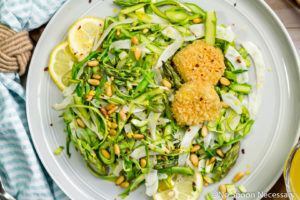 As well, since poaching does not require the addition of oil or fat to the fish (like pan-frying or deep-frying), there are no additional calories or fats added to the salmon. How long will poached salmon keep in the fridge? Can poached salmon be frozen? Poached salmon will keep, properly stored in an airtight container in the refrigerator for up to 3-4 days after it has been cooked. To further extend the shelf life of poached salmon it can be frozen for 2-3 months. 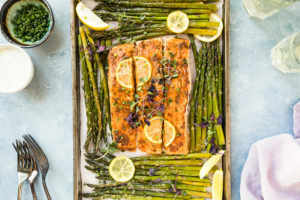 Once salmon is frozen and then thawed (overnight in the refrigerator) it will keep for an additional 3-4 days in the refrigerator. How to reheat poached salmon? Can poached salmon be served cold? The best way to reheat poached salmon is low and slow, meaning slowly and at a low temperature. To reheat poached salmon simply warm it on a rimmed baking sheet in an oven preheated to 250-300 degree F for 10-15 minutes, or until warmed throughout and the salmon reaches an internal temperature of 125-130 degrees F.
While salmon can be reheated, my favorite way to enjoy leftover poached salmon is to serve it cold! 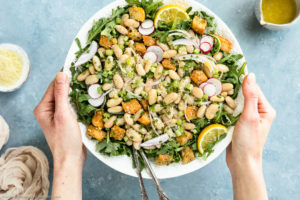 Simply flake the salmon and serve it cold on salads, as a filling for sandwiches or season it with a little sea salt and fresh cracked pepper and eat it plain! If you would like the salmon to have a beautiful sear (as shown in the photos), you can quickly pan sear it first and then poach the salmon in the skillet. To sear and poach salmon: Heat 1 tablespoon of neutral oil in a skillet over medium heat. Add the salmon filets, skin side up, and sear for 2 minutes. 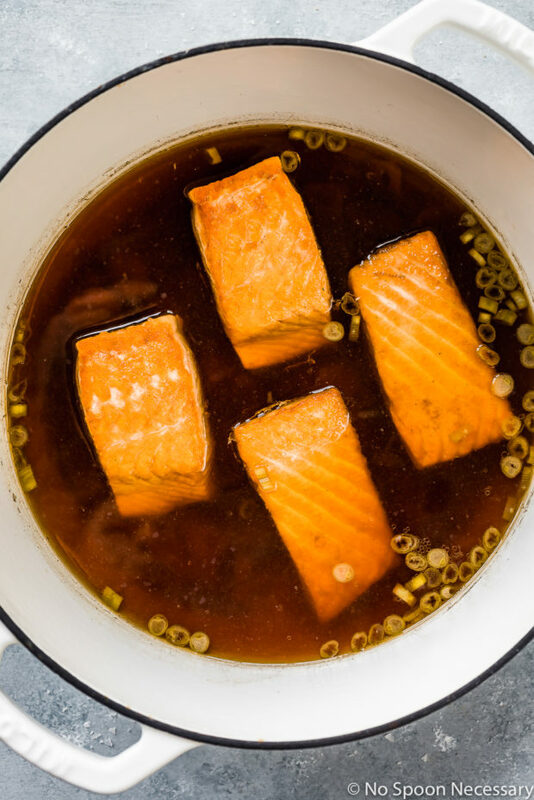 Flip the salmon and add the barely simmering green tea broth. Cover the skillet and cook for 4-6 minutes, or until the fillets are opaque and firm. Continue with recipe as directed. If you have access to an instant read thermometer, you want your green tea poaching liquid to remain a constant 140 degrees (give or take a couple degrees). Adjust the heat under your element to obtain that temperature. If you are going off of sight alone, no need to worry! The tea poaching liquid should have slight movement with steam rising from the pot. There shouldn’t be more than a couple little bubbles visible and the liquid should not be simmering. If you don’t like salmon, you can substitute halibut, snapper, haddock, cod or trout. Be sure to adjust the poaching time up or down according to the thickness of the fish filets. 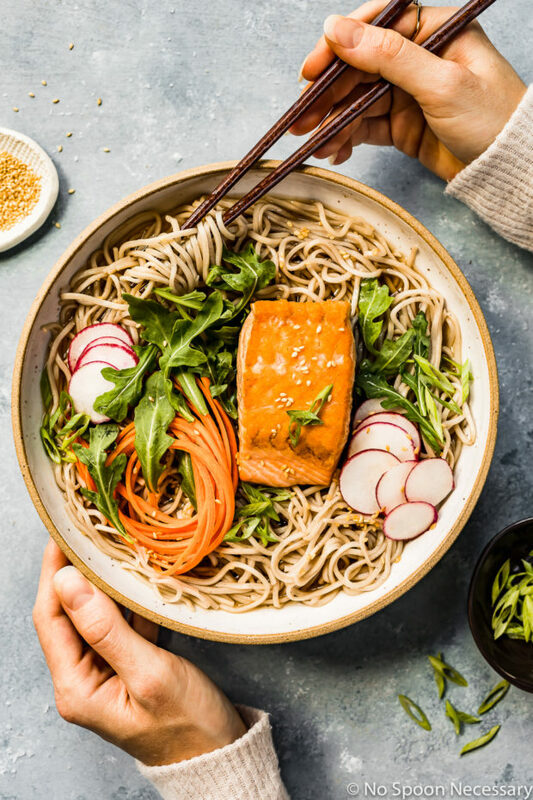 Flavorful, yet healthy and light, this Green Tea Poached Salmon Soba Noodle bowl is easy to make and perfect for busy weeknights! Until next week, friends, cheers – to a new and excting way to drink tea! Bring a large pot of water to a boil (for the soba). Once boiling, season the water generously with salt and lower the heat until you are ready to cook the soba noodles. Discard the tea bags and add the mirin and soy sauce. Return the liquid to the stovetop and bring to an almost simmer over medium heat. Poach the salmon*: Season the salmon generously with salt and pepper. Once the tea liquid is barely simmering, reduce the heat to medium-low*. Add in the salmon, skin side down. Cover the pan and cook for 8-10 minutes, or until the fillets are opaque and firm. Use spatulas to gently transfer the salon to a plate or cutting board season with salt and pepper. 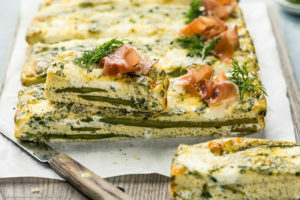 Flake into bite-sized pieces if desired. Tent to keep warm. Meanwhile, cook the soba noodles in boiling water according to package directions (approximately 4-6 minutes). 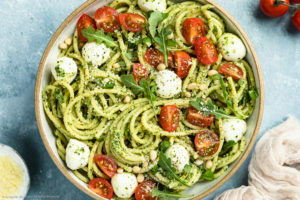 Drain the noodles and transfer to a large bowl, or individual serving bowls. 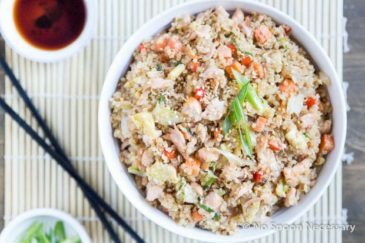 To serve: Top the noodles with pieces of salmon, radishes and carrots. Ladle with tea broth, top with arugula and garnish as desired. Taste and adjust for seasoning with salt and pepper. Enjoy! Are you sure your calorie count is not for 8 servings or that maybe you left off the the noodles when calculating it? 1/4 of a 9 oz package of dry soba noodle is already 227 calories. That’s not even counting the salmon. When I add this recipe up for 4 servings I keep coming up with 600 calories per bowl. Thank you so much for catching that!! For some reason the recipe nutrition calculator was glitchy and only counting the salmon as 5 calories. I sincerely apologize for any inconvenience this caused, but I greatly appreciate you bringing it to my attention!! The nutrition information has been updated, however please keep in mind that the values can vary depending on the products and brands you use. Cheers! It’s feeling like fall here (finally!) and I’m all about the cozy bowls. So intrigued by poaching salmon in green tea!! I can always count on you to come up with super creative, super delicious dishes! This is a must try! Such a fabulous way to poach salmon and I bet the flavors are incredible together! I am just loving the idea of tea poached salmon! And with the noodles, such a lovely meal 🙂 And yes, we are expecting our first “measurable” snow of the season on Sunday. So skipping Fall and heading straight into winter apparently. Fall has arrived here too and I;m loving it! Once again your creativity amazes me Chey! What a flavorful and satisfying bowl. I love salmon and soba noodles, so these bowls will be happening soon here. I love all the great tips you’ve included too. Thanks! Happy weekend ahead! I drink what sometimes feels like gallons of green tea every day but it never occurred to me to poach salmon in it. THANK YOU for doing it for me! This sounds amazing! Have a great weekend, Chey! Yummy! I had oolong tea poached salmon with wild rice a long while ago and this one reminds me that I should make one with green tea soon. Looks heavenly!